The department held its annual scholarship reception on Friday, April 22, at the Manhattan Country Club. Family, guests, donors, and faculty members joined our scholarship recipients and political science students for a lovely afternoon. The department awarded $17,800 in scholarship funds to undergraduate students, $5,700 to graduate students, and $87,450 to graduate teaching assistants for the 2016-2017 academic year. Graduate teaching assistantships also include over $76,433 in total tuition support. Catherine Caffera, senior in political science, German, public relations, and international studies, received the Don and Marian Button Political Science Scholarship. Ellen Crocombe, junior in political science, received the Reba L. Cobb Memorial Scholarship for Outstanding Women in Political Science. Sierra Lekie, senior in political science, economics and international studies, received the Louis H. Douglas Scholarship. Mohri Exline, junior in political science and international studies, received the Joseph Hajda Student Scholarship. Tera Terwilliger, junior in political science and women’s studies, received the Donald R. Hill Scholarship in Political Science. 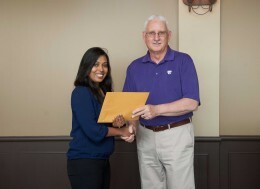 Jessica Gittemeier, junior in political science, received the Orma Linford Scholarship. Spencer Majka, junior in political science and criminology, received the Edward Allen McCoy, Jr. Memorial Scholarship in Political Science. Corinne Stratton, junior in political science, received the Edward Allen McCoy, Jr. Memorial Scholarship in Political Science. Victoria DeWeese, junior in economics and minor in political science, received the Barbara Meyer Memorial Scholarship. Madison May, junior in political science, received the Richter Family “Beyond the Campus” Scholarship. Kaitlin Stanley, senior in political science and international studies, received the Rieger-McCrery Scholarship. Brett Sitts, senior in political science and communication studies, received the Dennis K. Tapsak Memorial Scholarship. Heidee Prosser, junior in political science, received the Jon David Wagner Scholarship. Bethany Schifferdecker, sophomore in political science received the Jon David Wagner Scholarship. Matthew Parra, master of public administration student, received the John W. and Lynn L. Carlin Public Administration Scholarship. Danae Daellenbach, master of public administration student, received the Tummala’s Master of Public Administration Fellowship. MaKenzie Ruder, master of public administration student, received the Nicolas Salgo Political Science Scholarship. Matthew Zayas, master of public administration student, received the Nicolas Salgo Political Science Scholarship. Robert Satterwhite, master of arts in political science student, received the Raoul Wallenberg Scholarship in International Relations. Jarred Stindt, master of arts in political science student, received the Raoul Wallenberg Scholarship in International Relations. Morgan Wills, master of public administration student, received the Jon Wefald International Security Scholarship.